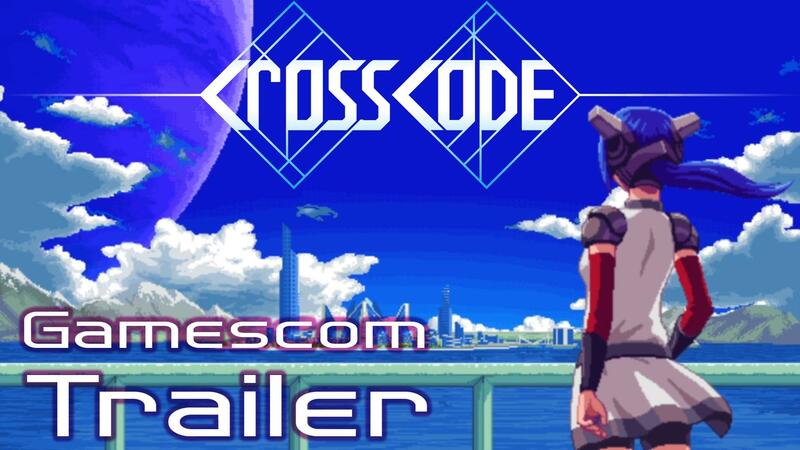 I’ve held off on ‘CrossCode’ [Steam] for quite a while, as it looked so promising I wanted to give it time to mature before taking a look. This Early Access retro-inspired action RPG is quite something now. Note: It doesn’t work with the Steam Controller by default, but luckily SC Controller exists and if you use that instead it will work fine! Such an extremely useful tool that, go grab it. Annoyingly, it always starts on the wrong screen for me, as I have two monitors. You can solve this by putting it into windowed mode, dragging it across and setting it back to fullscreen. CrossCode certainly gives a good first impression when you get into the game. The visuals are really quite beautifully done and it has a great atmosphere. While it is another retro-inspired game, it definitely has a modern feel to it and it has really smooth controls. You’re intentionally dropped into a scenario where you as a player will have no idea what’s going on. It's a race against time to try to save someone, but you're too late. After you wake up, you’re in a completely different location, unable to speak and your memory is gone. I realise a lot of games pull the “amnesia card”, but in CrossCode I feel it's done in a rather interesting way. I won’t spoil what it is, but I thought it was pretty fun. Once you get past the initial intro, you meet some new people and you go through a pretty standard training scenario. Even that was delightful to do, as you learn to control your weapons and abilities. What's quite amusing, is that you're initially unable to talk at all. They eventually enable you to say "Hi! ", so you go around saying that to people and you just glare at them afterwards. I love the character portraits during the dialogue, the character you control has a cute quality about her with the well designed expressions. I adore the art in this game! Essentially, you’re playing a game within a game, it’s gameception or something. You’re controlling an Avatar that can walk around and interact with real people. You’re in the real world from what I understand, which is weird. One bit did annoy me, which was during training with the Captain. You had to dodge bullets, while keeping your aim on a turret at all times. Go off even slightly and you have to start again. On the Steam Controller pad, that was annoyingly difficult. I hope they are able to tweak that, or not making it so unforgiving. The boss-fight in the starting section of the game was intense too. It was some sort of massive mechanical crab. Really interestingly designed and the battle shows off just how responsive and smooth the controls are. I haven’t gotten too far in the game yet, but honestly, I am really surprised by just how good the game looks and feels. The developers have clearly put a lot of thought and effort into every aspect of this game. I will have more thoughts of it when it exits Early Access, as I want to finish the story which isn't 100% in the game yet. At least I can tell you how well it works, for now. Go give it a try and tell me what you think! Once the game is finished and out of Early Access, it could prove to be very popular. I helped the developers out a little bit with sorting out some bugs and getting their Linux builds out. I've been super impressed with it so far, both in terms of the game that's there now, and also from the evolution/growth that I've been able to witness since I first got involved. The developers also do dev streams every now and again, which are fun to tune in to to check out their workflows/have a chat. I added my wish list. I'm a fan of j-rpg and this one seems to have a lot of potential. I have played as far into the game that is possible in early access. I had 100% in the Autumn's Fall (or is it Rise?) until the new update. The only complaint I have so far is that the developer's have chosen to not give the player the choice to disable the auto-jump functionality. There are free buttons on the gamepad and for the more platforming intensivee sections I would like to be able to trigger jumps on my own. The game is very odd in that the universe feels fairly cohesive, if not convoluted at times, but the gameplay is trying to be so many different things at once that it starts to get distracting. Twin stick shooter, crafting, fetch quests, pixel perfect platformer with no real jump button, bullet hell, JRPG...Some of the elements gel quite well, others not so much. I am kinda waiting for the lead character to jump into a giant mech suit and introduce a horizontal shmup stage or something of that nature. Already on my wishlist. Looks very promising. But I'll wait for the final release. I had this game on Steam.Acquired by a Steam product key,which i don't remember when or where i get it. I played it a little bit(about one and a half hour)last month and it was beautiful.If they keep Linux version steady(I'm using Linux Mint 18,earlier 17.3)this title would be a great indie.It has an interesting story,good gameplay and good keyboard-mouse controller settings. I've looked at this game several times and it's definitely something I'm interested in. As always, I'm waiting for the finished product to arrive before pulling the trigger. Thanks for SC Controller tip! This is by far the best site for Linux gaming news and tips. I pulled the trigger on CrossCode last weekend and was disappointed that I could not get my Steam Controller to work. I didn't want to resort to my Xbox 360 controller like some krill. Sweet! Looks interesting, any words on DRM? sn0rlax Thanks for SC Controller tip! This is by far the best site for Linux gaming news and tips. I pulled the trigger on CrossCode last weekend and was disappointed that I could not get my Steam Controller to work. I didn't want to resort to my Xbox 360 controller like some krill. Sweet! Keyrock I've looked at this game several times and it's definitely something I'm interested in. As always, I'm waiting for the finished product to arrive before pulling the trigger. Ditto! Looks good, this is my kind of retro game. But I'm not a fan of EA after Terraria. Even though Terraria didn't *call* itself EA when it first came out, it followed a similar path :-) I played ~200 hours until I burnt out, then a couple years later the game had about 2,000% more content to it, but I was already burned out on the game - never again!